Hunter syndrome or mucopolysaccharidosis type II, is a rare and life-limiting hereditary lysosomal storage disease caused by a deficiency of the lysosomal enzyme iduronate-2-sulfatase (IDS), the lysosomal enzyme that catalyzes a step in the catabolism of glycosaminoglycans. This deficiency leads to progressive accumulation of GAGs, particularly heparan sulphate and dermatan sulphate, in nearly all cell types, tissue and organs. Clinical manifestation include severe airway obstruction, skeletal deformities, joint stiffness, coarse facial features, cardiomyopathy and, in most patient, neurological decline and mental retardation. Death usually occurs in first decade of life but patient with a less severe form can survive until their adulthood. Hunter syndrome was first described by Charles A. Hunter in 1917 in his article A rare disease in two brothers. Since Hunter syndrome is a X-linked recessive disorder, males are the most affected. It was estimated approximately 2000 people are afflicted by Hunter syndrome worldwide, 500 of whom lives in the Unites States. A study in the United Kingdom indicates an incidence among males about 1 in 130000 male live births. Other studies identify a range of the disease from about 1 in 33000 to about 1 in 160000 male newborns. The mean prevalence all around the world is about 1,3 in 100000 but it can change from different country: in Japan estimated birth incidence of MPS II is 1/90000-1/100000 and in Korean patients is about 1 in 77000-94000 newborn boys. The accumulation of heparan sulphate and dermatan sulphate involves almost each organ of human body and in the consequence patient with Hunter syndrome complains of many different symptoms and manifest different signs. The average age at the onset of symptoms is 18 months (it is an early-onset disease) but it is variable and can be related to the severity of the disease and to different symptoms. The symptoms of Hunter syndrome don’t appear at birth and early developmental milestones may also be normal, but usually they start to become noticeable after the first year of life, despite the high variability. Often, the disorder starts with abdominal hernias, ear infection, runny nose and colds. These features don’t lead a doctor to make a diagnosis of Hunter syndrome because they are quite common among all infants. As the buildup of GAGs continues, signs become more visible. The typical patient with attenuated form is short and show a distinctive coarseness in his facial features, including a prominent forehead, a nose with a flattened bridge, an enlarged tongue, macrocephaly (with the skull thickened and deformed), large ears, wide-spaced teeth and early claw-hands with broad digits because all facial structure and tissues are thick. Significant arthropathy and connective tissue involvement lead to joint contractures. A combination of hepatomegaly and lax abdominal muscles leads to abdominal prominence. Patient also develops specific, pearly, popular skin eruption, which are usually first seen around the scapulae, but then spread to involve the trunk and upper thighs. This skin eruption, already noted by Hunter, are said to be pathognomic for MPS II. Direct bone involvement and sever arthropathy can lead to enlarged chest, flaring ribs, short stature and significant disability. Arthropathy afflicts especially hip joints and it is due to the damage in chondrocytes and osteoblasts caused by the storage of GAG. The progression of arthropathy involves all joints and leads to a severe restriction of motion and joint stiffness until compromise hand function and walking. The affection of bones is the cause of short stature. The teeth are small and shortened. Cardiac abnormalities are common in Hunter syndrome. Valvular involvement, with thickening and stiffening of the valve leaflets, commonly leads to mitral and aortic regurgitation and/or stenosis. Rhinitis and copious nasal discharge without obvious infection are common. The accumulation causes a thickening of walls, an enlargement of the tonsils, adenoids and tongue, a narrowed trachea and thickened vocal cords that contribute to upper airway complication. Rhinorrhoea tends to improve with age but upper airway obstruction and sleep apnoea became worst. People with Hunter syndrome may also have limited lung capacity due to pulmonary involvement. Hepatosplenomegaly is almost always present and it causes the protuberance of abdomen and hernias. Although organ size can be massive, it doesn’t interfere with their function. With age, loss of muscle strength and physical inactivity lead to constipation. Seizure is common in MPS II patients. The storage of GAGs in the brain can lead to delayed development with sub sequential retardation. The rate and degree of progression may be different for each person. In the peripheral system carpal tunnel syndrome is also common. About visual problems, the most common are the retinal degeneration, with decreased peripheral vision and poor dark adaptation, and the chronic papilloedema caused by the deposition of GAGs within the sclera. Hearing loss is common, with ear infection, Eustachian tube dysfunction, and damage to tympanic membrane and to the eight nerve. Audiological abnormalities can be both conductive and sensorineural deafness. All this symptoms inevitably lead to mental delay. However, it is a gross simplification because the disorder should rather be regarded as a continuum between two extremes and there is a broad spectrum of clinical severity. Although the clinical course for the more severely affected patient is relatively predictable, there is considerable variability in the clinical phenotype and progression of the more attenuated form of the disease. The difference between the two forms is mainly due to the progressive development of neurodegeneration, defined as the progressive loss of acquired neurological functions, in the severe form. However, also the mild form has quite serious effects. Between the two main forms the two most significant areas of variability concern the degree of mental retardation and expected lifespan. Individuals with the more severe MPS exhibit a chronic and progressive disease involving multiple organs and tissue and the onset of neurodegeneration was reported at a mean age of 6 years. They develop severe mental impairment and have life expectancies of 15 years due to neurodegeneration or physical complication, usually cardiac or pulmonary dysfunction. Behavioural disturbances can often mimic combination of symptoms of attention deficit hyperactivity disorder, autism, obsessive compulsive disorder and/or sensory processing disorder, although the level of symptoms may be different in each child. They also include a lack of appropriate sense of danger and aggresion. A research published on Orphanet Journal of Rare Disease (The impact of Hunter syndrome (mucopolysaccharidosis type II) on health-related quality of life, 2013) studied the impact of Hunter syndrome on health-related quality of life. In order to determinate the quality of life in patients with this disorder doctor collected different clinical measures. Forced Vital Capacity (FVC): pulmonary function was determined by spirometry. Six-minute Walk Test (6-MWT): the furthest distance walked in 6 minutes. Joint Range of Motion (JROM): this measure was employed to quantify the muscolo-sketal impairment. The JROM refers to the distance and direction a joint can move to its full potential. The study shows that MPS II has a considerable impact on both the physical functioning and psychological aspects of patients. Physical function and the ability to perform day-to-day activities were the most affected areas as described by all of the study measures, with specific dysfunction with regards to dexterity and upper body function. Pain and discomfort were also amongst the most prominently affected areas. Hearing represent the most severe disutility and it merits special attention given its potentially harmful effect on children, especially with regards to speech development and school performance if the deficit is not promptly recognized. The disorder has also a psychological impact, affecting self-image. The quality of life of parents and caregivers is also compromised, with psychological effect link stress and dejection. The visible signs and symptoms of Hunter syndrome in younger people are the first clues for diagnosis. In general the time of diagnosis occurs from the age of about 2 to 4 years but early diagnosis is therefore essential, particularly with the introduction of recent therapy. The severe form of the disease seems to be evident earlier than the attenuated form, hindering the development of the cognitive skills of patients, causing behavioural disorders during childhood. Neurodegeneration is typically observed around the age of 4-10 years. Delay in motor development may happen in both forms. However, mental retardation, speech delay, behavioural disorders and seizure are infrequent in patients with the attenuated form. Before making a definitive diagnosis, doctor may use laboratory tests to provide additional evidence by measuring the iduronate-2-sulfatase (IDS) enzyme activity. The most common screening for MPS II disorder is a urine test for GAG, that can be quantitative (measurement of total urinary uronic acid) or qualitative (GAG electrophoresis). However, it can be negative also in people affected by Hunter syndrome. The measurement of IDS activity in serum, white blood cells, or fibroblasts from skin biopsy allows the doctor to establish a definitive diagnosis. 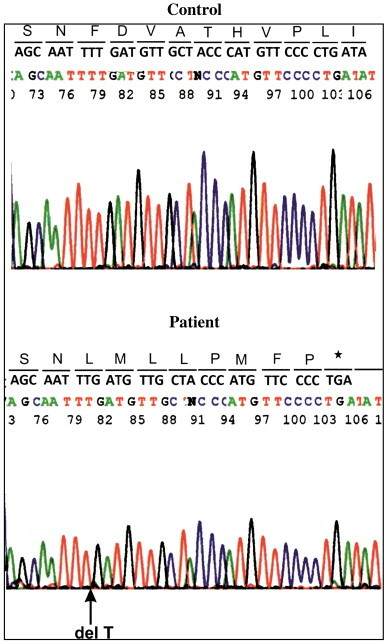 In some patient, analysis of the IDS gene can determine clinical severity. Prenatal diagnosis is available by measuring IDS enzymatic activity in amniotic fluid or in chorionic villus tissue. Because it is a hereditary disease, a DNA analysis can be useful to prove the carrier status. Two Hunter syndrome cases where analysed by the brain magnetic resonance and doctors find many areas of cerebral white matter, large perivascular spaces an ventricles. The iduronate-2-sulphatase (I2S or IDS) gene is located on the X chromosome, position q28. This gene is approximately 24kb in length with 9 exons. The IDS is an enzyme of the extracellular matrix. This part of the connective tissue is made up of a variety of sugars and proteins and helps to form the architectural framework of the body. One part of extracellular matrix is a complex molecule called proteoglycan. Like others, they need to be broken down and replaced. When body brakes down proteoglycans, one of the resulting is mucopolysaccharides or glycosaminoglycans (GAGs). The iduronate-2-sulphate enzyme cleaves O-linked sulphate moieties from the GAGs dermatan sulphate and heparan sulphate as the first step in their degradative pathway. In Hunter syndrome the IDS enzyme is partially or completely inactive because of mutations. In consequence, GAGs build up in cells throughout the body, especially in tissues that contains large amounts of dermatan sulphate and heparan sulphate. As this build up continues, it interferes with different organ function causing a lot of serious symptoms. The rate of GAG buildup is not the same for all patients, resulting in a wide spectrum of medical problems. Hunter syndrome is the only known X-linked recessive MPS disorder while others are autosomal recessive disorder. Since this disorder is an inherited disorder that primarily affects males, it is passed down from one generation to the next in a specific way. Since males have one X and one Y chromosome, if a male has an abnormal copy of I2S gene, he will develop Hunter syndrome. His mother is often a carrier. During egg and sperm formation, a mutation can develop in the IDS gene on his X chromosome. In this case, the mother is not a carrier and the risk of spontaneous mutation occurring again in a future sibling is low but not zero. Point mutations are the most common molecular lesion of IDS gene in Hunter syndrome, but they are not the only. The mutation responsible for the disease range from missense and nonsense mutation to small insertions or deletions or complete deletion of the gene. Total by nearly 400 different mutations have been identified in IDS gene with a severe clinical phenotype. Individuals with major deletions or rearrangements in the gene usually have severe MPS II but at the present the specific factor responsible for neurodegeneration that characterizes the sever form of MPS II are not fully understood. Because of the very specific nature of the illness, treatment has been proven very difficult. The therapy is diagnosed specifically for specific patients because all cases are different. About this treatment, there is a lot of clinical trials that asses the benefit and the potency of enzyme replacement therapy (ERT) with idursulfase. Idursulfase (Elaprase ®) is the recombinant human iduronate-2-sulphate produced by a recombinant DNA in a continuous human cell line by genetic engineering technology. The eight N-linked glycosilations sites are occupied by two bis mannose-6-phosphate (M6P) containing glycans that enable high affinity receptor mediated cell uptake and targeting to the lysosomes via M6P receptor. In addition, purified idursulfase contains sialylated glycans that prolong the circulating half-life of the enzyme. 6MWT and FVC: the distance was significantly increased in the weekly group compared to placebo and the %FVC was significantly increased too. The smaller effect in pulmonary functions may reflect difficult in accurately determining %FVC in patients with MPS II disorder. Liver and spleen volume: both were reduced with a statistically significant difference while weekly and placebo groups. Urine GAG levels: the urine GAG level decreased significantly in infused patients. Joint mobility: an improvement in elbow mobility was observed in the idursulfase group but no difference in other joints. One year of treatment with idursulfase was well tolerated. The most frequently reported adverse event included fever, headache, cough, pharyngitis, upper respiratory tract infection, nasal congestion, nausea, vomiting, abdominal pain and diarrhea. The number of patients with adverse event was similar in different groups. In some patients antibodies were detected and they were related to a minor reduction in urine GAG level. The results demonstrate that weekly infusion of idursulfase (0.5 mg/kg) produced a clinical benefit based on significant improvement in 6MWT and FVC endpoints. Intravenous administration of idursulfase has improved the somatic disease but is not expected to impact the CNS, and the severe form has a minor benefit. The weekly intravenous infusion of idursulfase, in opinion of many clinical trial studies, is able to improve many of the symptoms and signs of Hunter syndrome with a significant amelioration of the quality of life. This treatment was approved by the United States Food and Drug Administration in 2006 as an enzyme replacement therapy for Hunter syndrome. At the beginning of 2010, a clinical trial evaluated an intrathecal injection of concentrated idursulfase in hopes of preventing the cognitive decline of the severe form of the condition. Because the idursulfase can’t cross the blood brain barrier, a clinical trials has created a revised formulation of it, idursulfase-IT that has been developed to be suitable for delivery into cerebrospinal fluid (CSF) via intrathecal administration.